Despite the iPhone’s self-proclaimed revolutionary tendencies, many of the games available for the device are apt to nod to classic, older games. 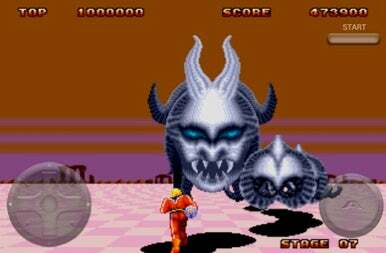 Following in the recent fashion of reviving fads that were popular in the eighties, Sega recently released an iPhone version of the popular arcade game, Space Harrier II. In the 80s games didn't have to make sense. For those who played outdoors during the rise of the original Space Harrier, don’t worry; the game is easy to dive into. The single player game allows players to control Harrier during his odyssey through Fantasyland in the year 6236. Make Harrier (who dons a red space suit) run, jump, and fly towards an infinite horizon as he fires at enemies who approach from both in front and behind. At the end of each level, Harrier must defeat a boss, who comes in the form of anything from a dragon to a wizard. The gameplay is relatively simple. Up until the boss battle, Space Harrier II consists mainly of avoiding any collision. Shooting at enemies is also required, but this is by no means a difficult game to master. Additionally, the iPhone app features the same, classic, bound-to-become-stuck-in-your-head theme song and the horrible groan effect that sounds off whenever Harrier runs into a tree or collides with a stray fireball. Visually, Space Harrier II looks just like veteran gamers will remember it: colorful, pixilated, and packed with obstacles to shoot, jump over, or run around. Harrier spends the entirety of the game running or flying forwards, and even though the backdrop may change slightly in terms of color or scenery, the graphics are really just a simple horizon scene. This is definitely not a modern, streamlined, 2010 version of the first game, but a reproduction of it. While this version of Space Harrier II remains faithful to the original, visually, the fact remains that a cell phone is quite a different medium than a television, gaming console, and handheld controller. The touch screen joystick leaves much to be desired. I had a hard time—usually around the appearance of the boss—keeping one eye on the action, and one on where my finger was hitting the controls. When I lost a life, it was often due to the fact that my thumb had drifted too far to the left of the screen to be of any help. Ultimately, the charm of Space Harrier II for iPhone lies not within its graphics or intellectual stimulation, but the retro feel players get from it. Those who remember dressing head to toe in denim during the eighties will like this game for the nostalgia it brings to the modern gaming platform.